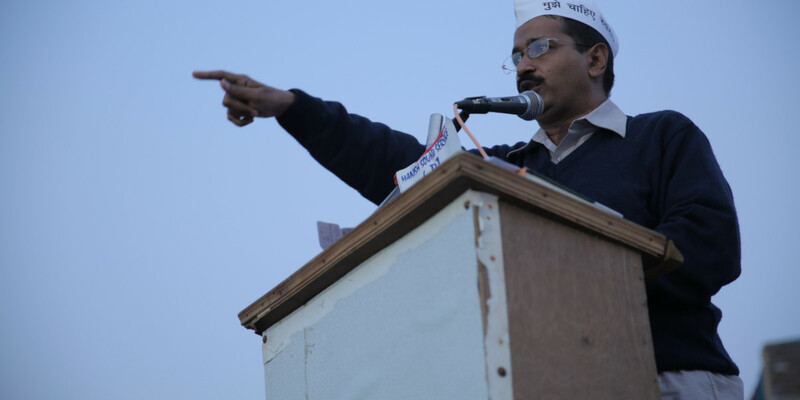 The documentary dives into the inner workings of AAP but doesn't lose sight of the human drama. This article was originally published on October 27, 2016 is being republished on November 17, 2017 in light of the film’s release. This small scene from An Insignificant Man—a documentary on AAP, recently screened at the Mumbai Film Festival—quite fittingly encapsulates the national mood three years ago, leading to the formation of an alternate political force in the country. Its title, An Insignificant Man, may, on the surface, point towards Kejriwal (a riff on his political party’s name, Aam Aadmi, the Common Man), but it seems to more accurately befit a country’s ordinary citizen, supposed to be the most powerful person in democracy and yet, as shown by history, the most powerless, deceived by the ones in power for decades. An Insignificant Man, in that case, is not just about a man and his party but also about a country on the verge of implosion, its people desperately wanting to reclaim what had been denied to them for long. The story of AAP’s formation is also the story of a certain kind of India: young, new, impatient, an India that embraces activism in favour of cynicism, and it is this story that interests the directors of the documentary, Khushboo Ranka and Vinay Shukla. Following Kejriwal and his cohorts for nearly a year, from the early 2013 to the end of the year, when the Delhi legislative assembly elections were held, Ranka and Shukla show us the bare bones of a political campaign that had been dismissed by many, including the then Delhi chief minister, Sheila Dikshit, who said, among other disparaging remarks, that “Kejriwal is not even on our radar”. We know what ultimately happened, which further makes this documentary a riveting watch, for it makes us go back in time and see the origins of a political agitation, a nation shedding off its indifference. A documentary’s eventual outcome depends a lot on the access given to the makers. Ranka and Shukla get that in abundance, and make good use of it. They sit in on many confidential party meetings (the note on the door reads, “Work meeting—outsiders not allowed”), capture Kejriwal in his personal moments (at home, trying to take a nap during his 15-day fast; watching Satyagraha in theatre, a film purportedly based on his life) and follow the party’s candidates on their door-to-door campaigns. However, any revolution, irrespective of its duration, is romantic and heady, offering the promise of permanence and panacea, and, hence, it’s easy to lose oneself in such a story. But Ranka and Shukla are smarter than that. Given the nature of political mood in the country then, this documentary could have easily turned into a hagiographic portrait of Kejriwal and AAP but, thankfully, it’s not. The filmmakers show a well-rounded picture of the movement, showing how people contradict themselves, confrontations dance around camaraderie, and fissures begin to appear in what once looked solid and perfect. In one fascinating scene in the documentary, an AAP volunteer questions Kejriwal about the appointment of candidates. (Kejriwal had initially said that party candidates would be voted by volunteers, but after a few weeks, changed his stand.) The volunteer wonders why Kejriwal has backed out on his promise, but the things unsaid are far more notable, presumably the suspicion whether Kejriwal, too, turn out to be like any other politician—reneging on his promise? The room’s rife with tension; the volunteer is almost accusing Kejriwal, but he can’t say so explicitly, for the power equation between them demands diplomacy. Kejriwal, on the other hand, isn’t ready to budge, and he makes his stand clear, in terms not so polite, exercising his power to shut the volunteer down. An Insignificant Man is always alert to these backstage moments, where members of AAP are constantly surprised by the might of their movement, which threatens to outsize and consume them. Similarly, when some journalists tell an early AAP member, the psephologist Yogendra Yadav, that Kejriwal has made a bunch of unrealistic, and populist, promises, the former is perplexed and becomes quiet. No one is perfect or assured or calm in this documentary; instead, they are just one uncomfortable question or incident away from descending into self-doubt and despair. On a macro level at least, there’s not much in this documentary that will take you by surprise. You know the principal characters, the stakes involved, and the outcome. Besides, An Insignificant Man tells the crucial events in the AAP story chronologically, but even then, the film is thoroughly engaging, darting from one scene to next, showing a discernible urgency not uncommon to the party itself in those days. It’s heartening to know that Ranka and Shukla not only get the politics right but also cinema. The documentary dives deep into the inner-workings of AAP but doesn’t sacrifice the elements of human drama while doing so. An Insignificant Man, for instance, is also quite funny. What’s more impressive: That it derives its humour not from jokes or obviously funny situations, but from situations small and mundane. On the day of the election results, when Kejriwal’s leaving his house, his mother asks him, “Raat ko late ayega kya (will you come home late tonight)?” To which, he simply replies, “Haan, 11-12 baje (around 12).” Then, there’s the background score that seems to follow a narrative arc of its own: from a slow hum in the initial segment to a rising beat in the climax. The final act of the film, however, is most impressive, smartly shot and cut, breathlessly moving from shots of Kejriwal to Dikshit to election control room to AAP’s office, resembling a well-made thriller. The country’s political landscape has massively changed in the last three years. There’ve been substantial changes within AAP, too. The story in An Insignificant Man is, of course, quite different from the story being played out in the real world now, but that doesn’t make An Insignificant Man any less important. Because we’ve heard the story of Goliaths a plenty of times, it was about time someone told the story of David as well.